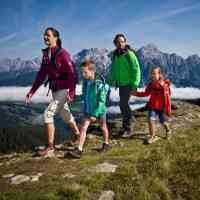 Your hiking fun in Leogang starts right outside the family and sport hotel Bacher: Choose from family-friendly hiking trails, relaxing vitality paths, guided hiking tours and challenging mountain and summit experiences. 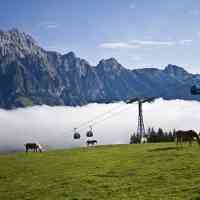 The hiking region of Saalfelden Leogang is one of the largest in all of Austria. The craggy limestone mountains of the Steinernes Meer and the Leoganger Steinberge alternate with the gentle knolls of the green Pinzgauer Grasberge. Over 400 km of perfectly signposted and cultivated hiking trails – from easy to difficult – run through the diverse hiking region in the Pinzgau. 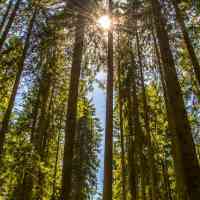 Families with children, connoisseur hikers, experienced hikers and summiteers find exactly what they’re looking for here. 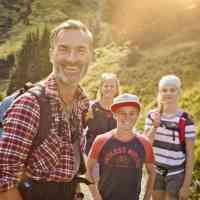 The hiking programme in Leogang Saalfelden will definitely turn your hiking holiday into a sure-fire summer smash hit! Choose from a wide variety of guided hiking tours, workshops and guided tours from May to November – participation is free of charge for you as a holder of the Löwen Alpin Card. Hiking events such as the Hiking Camp, the Stoabergmarsch24 and the Bergwelten hiking day shine a light on the multifaceted aspects of hiking in the province of Salzburg. Be part of it! Please sign up for your programme of choice by 5 pm the previous day. 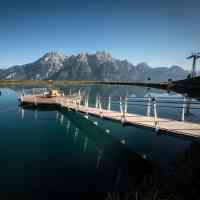 You can take advantage of all offers for free with the Löwen Alpin Card. Plan your hikes and mountain tours with the interactive tour map. Choose between easy, medium and hard hikes, and themed hikes. 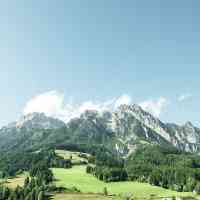 We recommend the companionship of a hiking guide for mountain tours: Get a list of mountain hiking guides in the Leogang Saalfelden region with one click. Enter the Asitz gondola cable car right next to the family and sport hotel Bacher and float effortlessly up to the intermediate or mountain stations. Multifaceted paths, games and relaxation await families at both points. The high-altitude hiking trails get you and your okids moving before you arrive at the Senses Park at the intermediate station. If you feel like relaxing in the water afterward, you’ll find a lake with a view near the mountain station. Has professional or family stress got its firm grip of you, with thoughts rotating round your head? Then it's time for a hiking holiday that allows to get some distance from everyday life, step by step, while restoring your inner balance. Vitality trails marked with a green cloverleaf await you in the hiking region of Saalfelden Leogang. 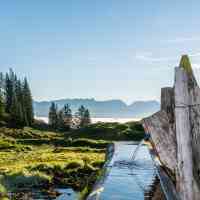 These easy and medium hikes with particularly beautiful nature provide peace, relaxation and regeneration.